It's Facebook Fridays! for December 9, 2016! The scintillating allure of minerals and gemstones calls us to crystal gazing and spellcasting. The Lucky Mojo Curio Company is holding a random drawing to give away 5 Crystal Magic spiritual supply prizes for divination! 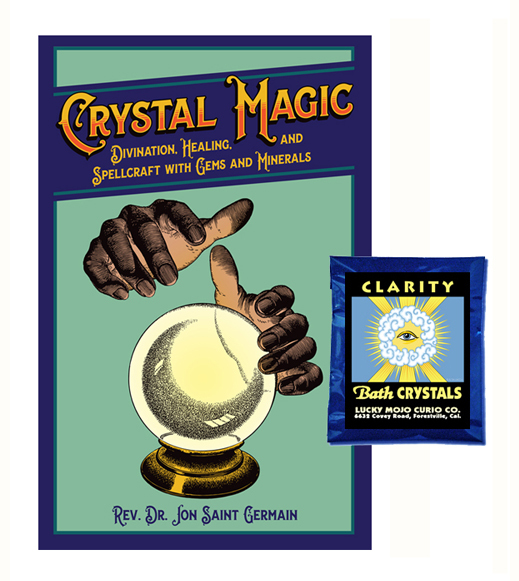 This week each lucky winner will receive a copy of Crystal Magic: Divination Healing, and Spellcraft with Gems and Minerals, by Rev. Dr. Jon Saint Germain, along with a packet of hand-made Lucky Mojo brand Clarity Bath Crystals to cleanse and prepare you and your precious stones for oracular labours! First thing tomorrow morning, we will select FIVE winners at random, and ask them to message this Facebook Page with their mailing addresses, so we can send them their FREE Crystal Magic prizes. All you have to do to enter is to scroll down and post a comment to this Facebook Fridays! status message for December 9, 2016. This is a super-cool combo prize -- and we are giving away FIVE of them, so do go to the Facebook page and add your comment. If you don't you'll never be a winner! We have a winner! In fact, we have 5 lucky winners! Our Facebook Fridays! winners for December 9, 2016 are: Stephanie Bellucci, Ron Ritzer, Dominick Guerriero, Felicia Brown, and Christopher Davis.